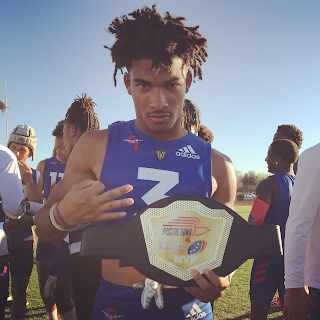 Passing Down is the premier platform for elite 7-on-7 tournaments in America by being a showcase for top athletes to compete against their peers in a competitive environment on the West Coast. It is the model that other companies strive to replicate; QB-tees with timers, certified refs, an event coordinator/DJ with PA system, synchronized game clock, live event blog, social media interaction, and live game streaming are a few of the industry standards that Passing Down was the first to initiate. This year, high school and junior high teams are guaranteed four games in every regional tournament on the circuit. Each tournament has pool-play with a single elimination playoff; all conveniently completed in just one day.